I wrote over the weekend that the blog Mondoweiss had published a fundraising pitch which falsely reported that the blog needed readers to contribute funds because it was "under Israeli attack". (Read here.) Since that fraudulent fundraising pitch was revealed here, the editors of Mondoweiss have deleted from their website pages documenting both the initial fraud and subsequent admissions by one of the editors that their attack report was false. Despite those apparent cover-up efforts, a cached version of one of the scrubbed webpages can still be read here; a text-only version is available here. Below is a screen shot of an exchange of comments between a reader and Mondoweiss editor Adam Horowitz from a cached version recovered after Mondoweiss deleted the original earlier today. The concerned reader, writing under the screen name "seafoid", asks for more information concerning the blog's June 27 report that it needed assistance because it was under "Israeli attack". Horowitz admits without explanation that the report was false, and that the fundraising pitch had been edited to reflect that fact. Since the time that exchanged was posted, the blog has offered no other comment on or explanation of the fraudulent fundraiser. In fact, instead of addressing the serious ethical questions raised by their use of a false news report in soliciting donations from readers, they seem instead to have chosen a more Nixonian approach, simply deleting, first, the initial false report and, subsequently, the editor's admission that the report was false. The blogs editors have failed to reveal who wrote the false report and how it came to be published on their blog. To refresh your memory, below is a screen shot of the fraudulent fundraising pitch which I found in a cached version after Mondoweiss had deleted the original from their website. That false report was signed by Mondoweiss editors Philip Weiss and Adam Horowitz, and was posted by Mondoweiss blogger Alec Kinnear. While they have deleted the original version, that webpage is still available in cached version here. A subsequent version without the claim of Israeli attack is available in cached version here. Rather than address the ethical questions raised by the revelation that they published a false news report in order to solicit funds, Mondoweiss has chosen instead to simply wipe clean the record of both the initial report and their subsequent admission that it was false. This pattern of repeatedly covering up the facts concerning this matter raises further, extremely serious, questions about Mondoweiss' ethical standards. Can journalists be considered journalists at all when they file false news reports to raise funds, then cover it up? I've argued for some time, Adam, that rather than the uncertain distinction made in calling Mondoweiss an anti-Zionist blog, the proper label, clearly, is as an Antisemitic blog. Your last few posts, especially in highlighting the presence on the blog of Alec Kinnear, is just further demonstration. gee adam, i'm not sure how much blood you think you can squeeze out of this turnip. i didn't think twice about the headline when i read it. everyone knows the ifm is a support system for hasbarists to defend israel legitimacy, they've written news articles about it. it's not like a secret. mondoweiss probably gets more traffic than any i/p blog, anywhere. so why don't you tell me a good reason why a government agency like the israel foreign ministry, who provides free internet tool to online activists (giyus)screenshot wouldn't focus on mondoweiss? where's the competition? it's just a fact mondoweiss is getting better, stronger and more traffic. so, i assumed when they said 'under israeli attack' they meant by israel's hasbara team. i didn't give it much thought. is that all you got? Your real argument is with Adam Horowitz, who admitted in a comment on Mondoweiss that the "Israeli attack" report was false. You seem to think otherwise, for reasons that are not entirely clear. When you say that you "didn't give it much thought", I'll take you at your word. Considering that Horowitz' admission that the report was false has been deleted from the blog without explanation, I can understand your confusion. You can review a screen shot of it on the next post on this blog and revise your comment if you like. 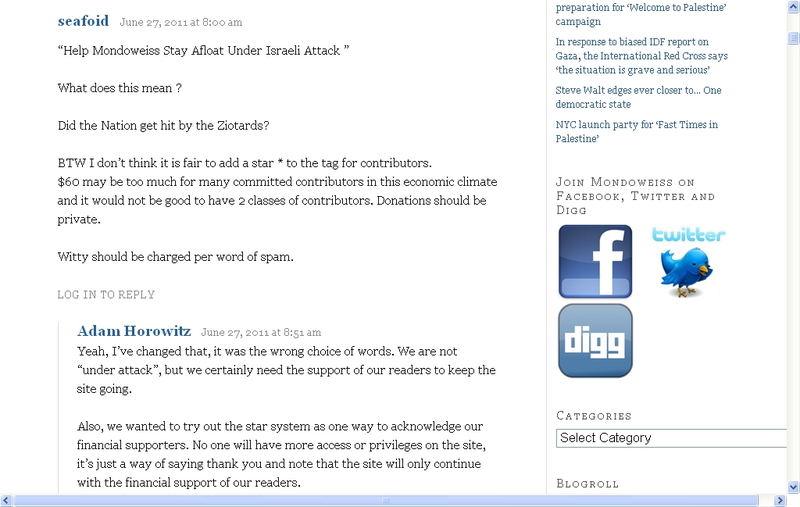 So what if Mondoweiss gets traffic? It doesn't make it better, or more worthwhile. Lew Rockwell's site gets a lot of attention as well, despite the fact that it hosts some of the most troglodytic writers on the net. And last time I checked, the best places to get the information was -gasp- media sources. Haaretz and Maariv and Jpost are both accurate. I'm not going to consider a blog that hosts and posts openly bigoted a good source of news. Of course, I gave it a little bit of thought. The admission by Adam Horowitz concerning the falsehood of the "Israeli attack" claim can be viewed in this post. Feel free to comment on how it is that you believe Mondoweiss to actually be under Israeli attack when the editors of the blog admit that it is not. The real road to Palestinian statehood?